Small Plot Big Ideas in print again! The blog posts here may have been much less frequent in recent weeks due to work commitments but they can’t compete with my “regularly” published articles in Home Farmer magazine. The first article was in the May 2013 issue and the latest has just been published in the August 2014 issue. Obviously an article every year or so may not be considered prolific by most people and I won’t be giving up my day job any time soon as a result. However I’m happy to think that technically speaking I’m a published writer and it’s rewarding to see my efforts on the page when they finally make it into print. Hopefully this has helped to counteract what in my opinion seems to be a bias towards Wales and South West England in the smallholding magazines. There are plenty of smallholders in other parts of the country as well. I hope the wider reading public feel that their boundless patience after my original article has been amply rewarded by this latest article. 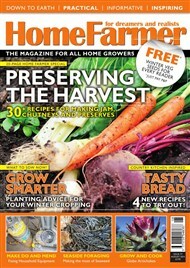 If you don’t already subscribe to Home Farmer then you’ll need to buy a copy if you want to read the article. However I can highly recommend the informative and wide-ranging content in each issue so, in my opinion at least, a subscription is worth every penny! Unfortunately this particular series of articles has probably reached a natural conclusion but I’m very happy to consider any other ideas for future articles.